I am a big fan of photographer and Turner Prize winning artist, Gillian Wearing OBE. Her photographs are both familiar and deeply intimate. She asked ordinary people to write whatever they were feeling on a card and hold it up, then she photographed the result. You will recognise her work at once. http://www.tate.org.uk/art/artists/gillian-wearing-obe-264. Its a style that launched a thousand adverts. Now, I come from Birmingham. In my youth it was a tightly conventional city, but that’s changed, and I never realised how much it has changed ’til I saw that the ‘city elders’ had commissioned Wearing to produce a statue for the New Birmingham Library. 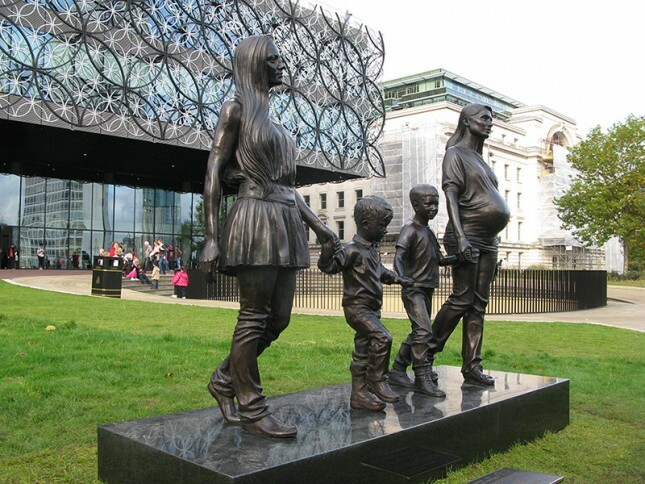 Her bronze is called ‘A real Birmingham Family’ and it depicts what appear to be two sisters holding the hands of two small boys, for in this family there are no men. It’s a slap in the face, (I can’t think of any other piece of city ordained artwork in the UK that is this radical). I find it rather brilliant and shaming. It reminds me of two things all the kids who are missing fathers and secondly we are almost all brought up by women.